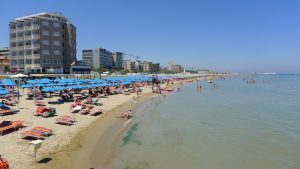 The beaches at Pesaro, Fano, Riccione, and Rimini are 20 – 30 miles away. They are easily reached via local bus service that runs numerous times each day. Le Marche can boast one of the highest number of Blue Flag beaches of any region in Italy. The prestigious Blue Flag is awarded by the Foundation for Environmental Education to environmentally well-kept beaches across Europe. The important "eco-label" is given to sites that meet strict criteria including water quality, environmental management, safety and other services.